If You Are New to Reef Central, Introduce Yourself Here! I have come to this site for several years when I had questions, but never formally took part. We had a reef tank, had trouble so changed to fresh water and didn't like it so went back to reef tank. We have had our reef tank up and running now for about 3 months with all water perimeters staying perfect, soft corals (anthelia, torch, mushrooms, green & brownstar polyps, branched frogspawn all doing awesome & growing beautifully. We have a clean-up crew of 2 emerald crabs, 1 cleaner shrimp, 1 astraea turbo & 2 nassarius snails, a Black/white with orange face clown, green clown goby & a bi-color blenny along with a few hitch-hiker brittle worms and mussels. All are doing well. We just got the starfish and I am concerned because I told the LFS that the tank was 3 mos old, but doing well with good levels/healthy tank and they said it would be o.k. He had gone to the top of the tank and is partially out of the water, which they said to be careful not to let air get to him after I acclimated him to our tank (drip acclimated for 1 hour) and put him in. I was careful not to touch him and didn't let him get any air, but now he is doing it himself. Should I be worried? What do I do? Oh - BTW the starfish is a black-tipped red star. I have one mangrove I was trying in my 30 gal reef nano. It is turning reddish brown but still is green too. I started getting one white root, but it turned red too. All the leaves fell off the very top (it is above the water by about 2 inches and doesn't appear to be doing anything much. Is it dying? I know they apparently grow very slowly, but I don't know what to expect. My nitrates are zero in my tank, hoping that's because the mangrove is doing it's job. Thoughts? a new guy in reef tank. Kids are moving out and have some time again. Picked up several tanks and equipment as I begin to learn about reefing after about 30 years since my last saltwater tank in 1987. Wow! Things have changed! I'm Jasper (or Jazz). I have always been interested in starting my own reef but now that I have a steady(ish) job that will get me the funds nessesary to begin this awesome hobby I've begun reaserching like crazy. I don't have a tank or anything yet. I've mostly been calculating cost and reaserching equipment. I already have a good idea ok what I want in my tank and how big I'd want it (30-40gal). 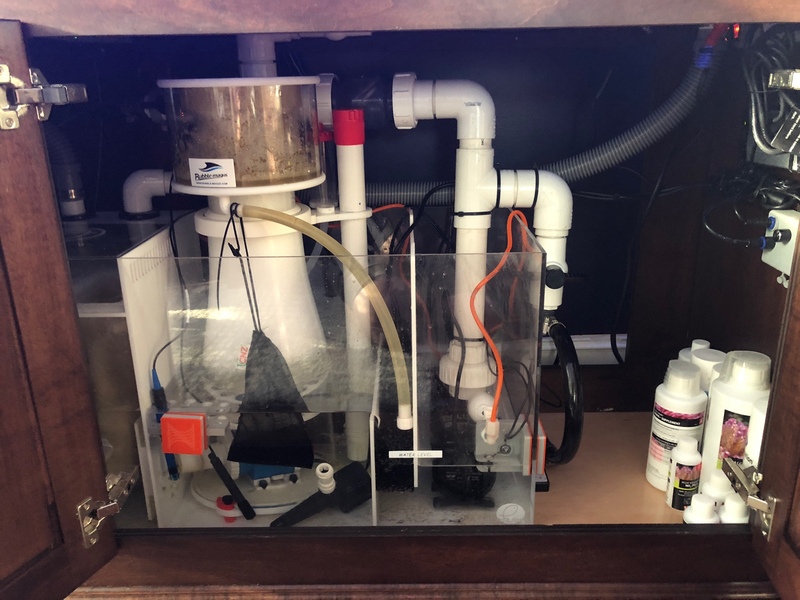 I am trying to decide if building my own stand is worth it so that I will be able to customize how I set up my sump right underneath the display tank while still containing some storage for water quality testing kits and other miscellaneous things I will need over just buying one. My father use to be a carpenter so I'm sure if I asked him and explained what I wanted he would do it no problem. But yeah. I am super exited. I plan to start my reef within the next 3-6 months with just soft corals and adding fish and whatnot later. Aaaaaaa. New to salt water tanks and new to RC as well. 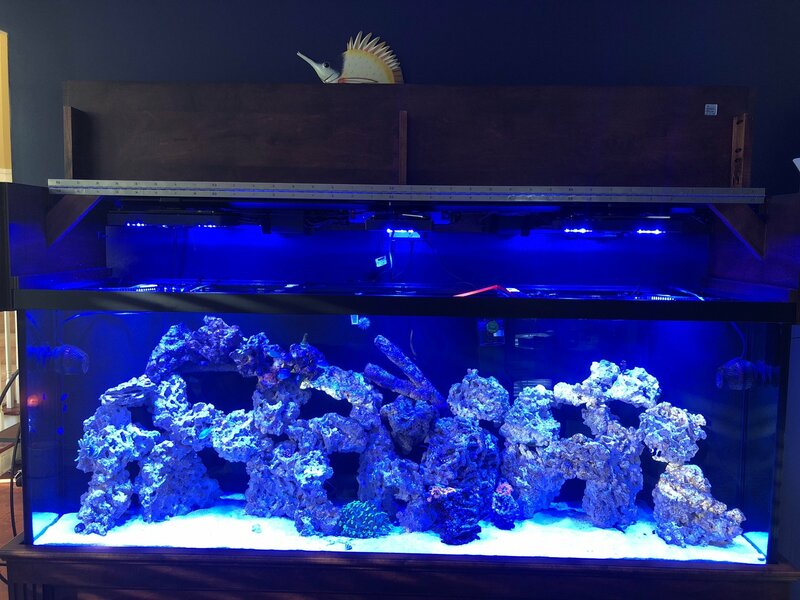 My brother in law has(d) a 130L saltwater tank that he got when he was living in his apartment. He bought a house about a year ago that came with a much larger built in tank together with an RO water system etc. He got married and had a kid and as such the demands have been big to maintain two tanks. He generously offered to have his sister, my fiancee, take the tank. So here we go on the next big aquarium adventure. Going to be doing a lot of reading and asking of questions. Hey all! The wife and kids got me a fish tank for my birthday! I'm new to the hobby. 60 gallon tank. Will start fresh water. I've spent so much time ove the years reading forums here but now I've decided to take part and post my unique situation here and see what type of insight I can gain from the community. Im experienced in aquaria: been keeping a planted freshwater tank for over 7 years now. Hello, everyone! Newbie here. I'm glad to have found this great online reef central community. I'm hoping to learn more from the other members here. Cheers! Hi I first joined in 2003 and I've taken over a decade off from reef keeping. I'm starting back up again with a reef tank from scratch. I'm surprised how far the technology has come and I have a lot of reading to catch up on but I definitely have experience with the hobby and just wanted to say HI! Hello everyone. Many years ago I had some fish only saltwater tanks, and about 10 years ago I did some research on reef tanks, but never got around to it. Recently I have acquired the bug again, and I found this forum. I am looking into starting up a reef tank somewhere between 40 gal to 120 gallons. I'm looking forward to checking out your setups during my quest for knowledge. Looks like you are off to a great start with that tank. I am still in the early planning stages for a tank. Looking forward to seeing how your tank progresses. Have fun! Thanks and good luck with your planning! Hope you get in soon! Hello, rschram19! Glad to have you back. New to the hobby. Fish help please! Hey everyone. My name is Trevor and im new to the saltwater fish hobby. I have a 32 gallon Biocube. Only a few live rock in it at this time but I was wondering what some good starter fish are that I should look into? Thanks! Hey guys! 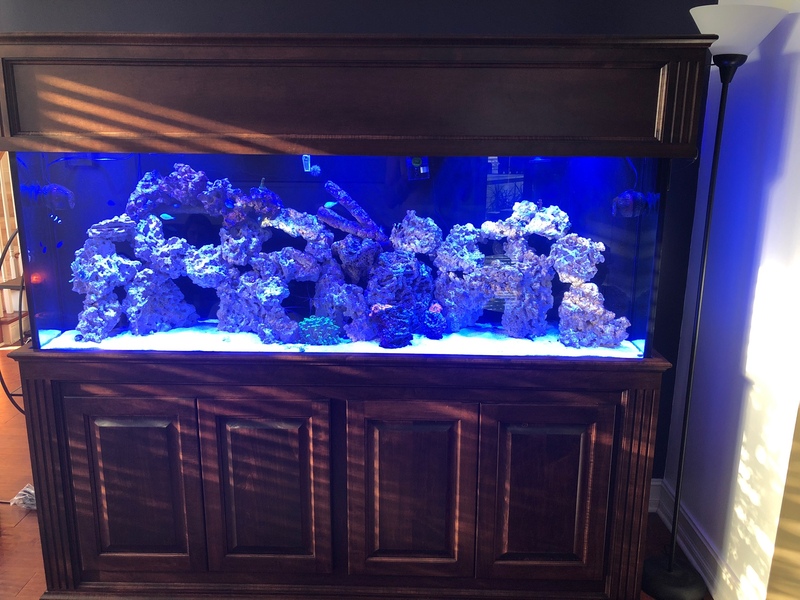 I'm new to the forum but have had a 75 gallon reef tank for over 3-4 years. The tank was inherited to me about a year ago and I could use the help/advice! Also, does anyone have a simple solution on how I am suppose to upload pictures onto here. Every time I try it, it says that it fails to send. Hey Ya'll. Back from the saltwater grave. Never posted here, but been lurking around for a while. Setting up a frag system in my basement before I get to set up a DT. Glad to be back into the hobby and looking forward to learning more! Hello and welcome. It's a great place with a wealth of knowledge, and some very helpful and friendly folks!